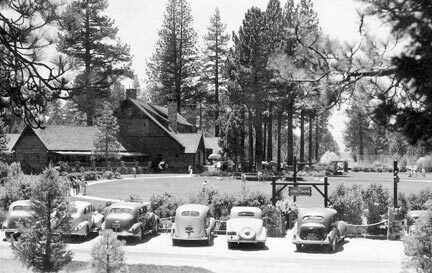 Unlike most of the other early Big Bear resorts that were being built in the 1920’s, the Pan Hot Springs Hotel and the Peter Pan Woodland Club were unique in that they were located at the east end of Bear Valley, away from the lake. 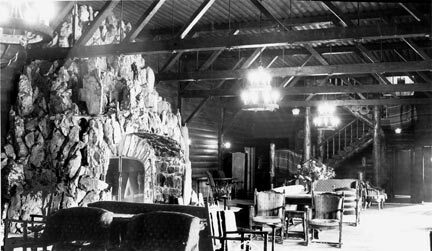 The Pan Hot Springs Hotel main attraction was that it was located on a natural hot spring. The hotel had two swimming pools that took advantange of the natural hot mineral waters. 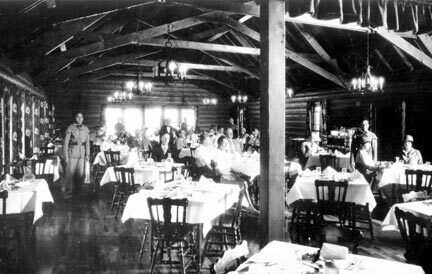 The Peter Pan Woodland Club was also built in the same area at about the same time as the Hot Springs hotel. The Woodland Club is remembered today as the most exclusive of all of the early Big Bear resorts. 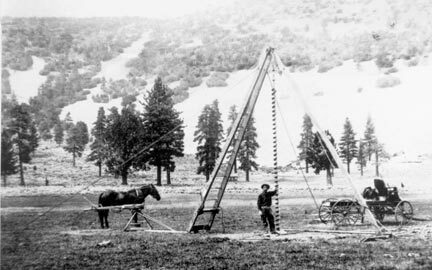 It was also responsible for the community of Big Bear City. For more information on these two important resorts check out the articles under Big Bear City Lodges. Here are a few photos of these two lodges. 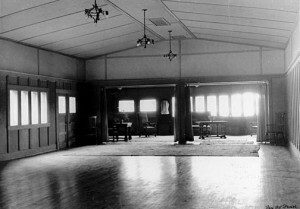 The Pan Hot Springs Hotel, circa 1926. 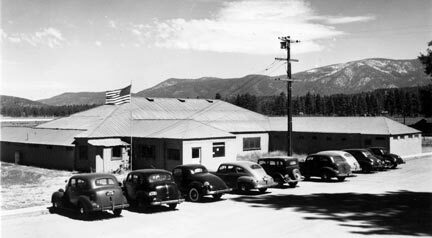 The hotel was located just east of today’s North Shore Drive and Paradise intersection in Big Bear City. – Rick Keppler collection. 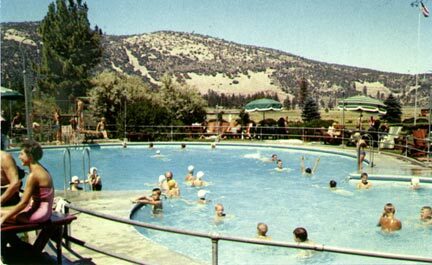 The outdoor swimming pool at the Pan Hot Springs Hotel. – Rick Keppler collection. 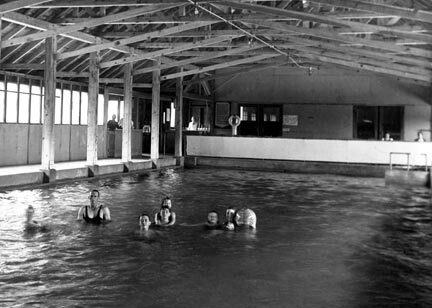 The Pan Hot Springs indoor pool in the late 1920’s. – Rick Keppler collection. 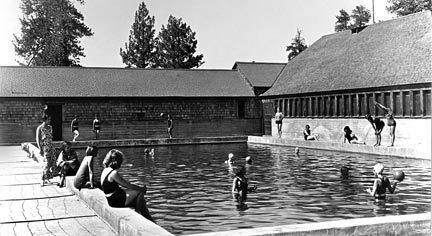 In the early 1920’s, before the hotel was built Phelix Scheer was hired to drill into the hot spring to increase the water supply for the two swimming pools that were planned for the hotel. – Fred Ransom collection. 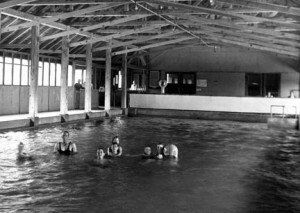 The Pan Hot Springs hotel was never rebuilt after it burned in 1933, but the swimming pools were restored and opened to the public. They served the community until the early 1990’s when they were eventually closed because of earthquake damage. – Rick Keppler collection. 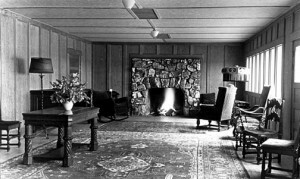 From the mid 1920’s through the late 1940’s, the Peter Pan Woodland Club was the most exclusive club in all of Big Bear Lake. It was solely responsible for creating the community of Big Bear City which sprang up around the lodge. Check out the “Big Bear City Lodges” article on the right for more information on this fabulous resort. 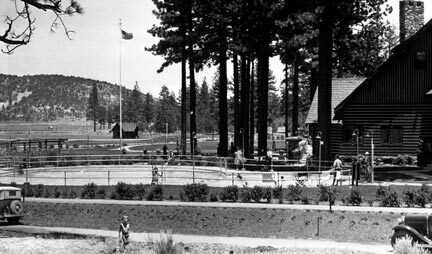 Located in Big Bear City at the intersection of Country Club and Greenway, the Peter Pan Woodland Club was established in 1925. – Rick Keppler collection. 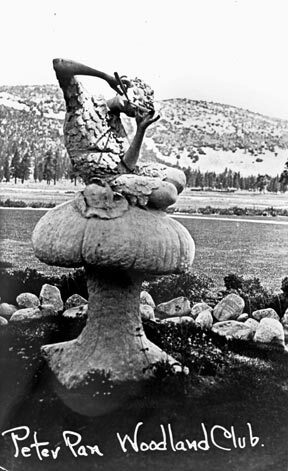 For many years this statue of Peter Pan greeted guests as they entered the Woodland Club’s grounds. – Rick Keppler collection. This 1920’s distant view of the Woodland Club looks south along Greenway (on the left), and across what is now the east end of the Big Bear City’s airport runway. – Rick Keppler collection. 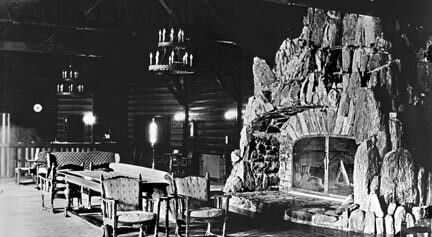 The main lounge of the Peter Pan Woodland club had a huge rock fireplace. The fire pit was large enough to hold the front end of a truck. It also had a model railroad built into it with a train that wound it’s way through the rocks. – Rick Keppler collection. A view of the massive rock fireplace from the opposite direction. – Rick Keppler collection. The Woodland Club had it’s own golf course, tennis courts, bridal paths, a movie theater, and a unique figure eight shaped swimming pool. This view looks north-east towards Greenway. – Rick Keppler collection. This view of the Peter Pan Woodland Club’s unique figure eight shaped pool looks north across the golf course. Today, this is the east end of the runway at the Big Bear City airport. – Rick Keppler collection. 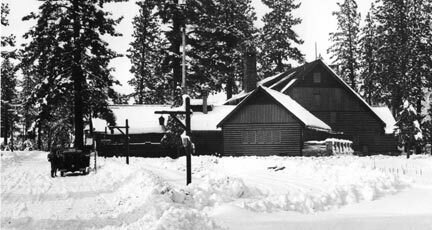 A rare 1930’s winter view of the Peter Pan Woodland Club. – Rick Keppler collection. 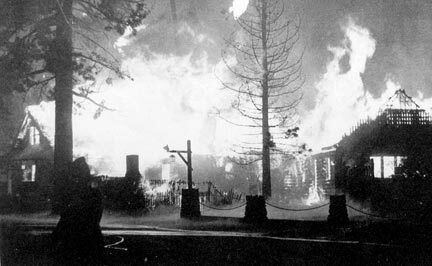 The Peter Pan Woodland Club’s reign as Big Bear’s most exclusive resort came to an end on June 18, 1948, when the main club house was reduced to ashes by an early morning fire. – Rick Keppler collection.